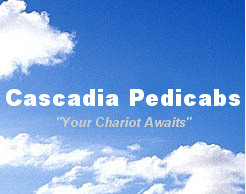 We are proud to be Portland's largest Urban Chariot fleet. We provide safe, fun, and environmental tricycle transportation. Our shop is in the heart of Chinatown. Think of us when you need to get around downtown. We pedal all sorts of Portland events. Schedule us for your next occasion.